St. Francis Center Goes Green! We’re not just feeding our guests in need, but we’re also helping the environment! 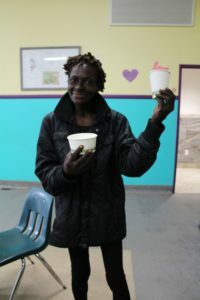 One of our guests, Cathy, holding up our new tableware! 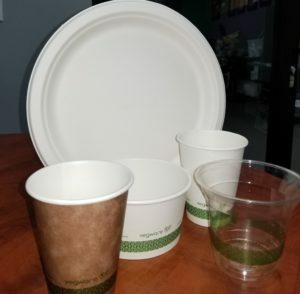 Starting this week, SFC will stop using plastic and styrofoam products for our daily served meal programs and become the first homeless service provider, to our knowledge, to begin using plant-based compostable tableware, utensils and cups provided at a discounted rate by our partner Vegware! In the future we’ll also start composting our excess food and will implement community-based outreach programs to educate our community and guests on the importance of composting, recycling and minimizing food waste.